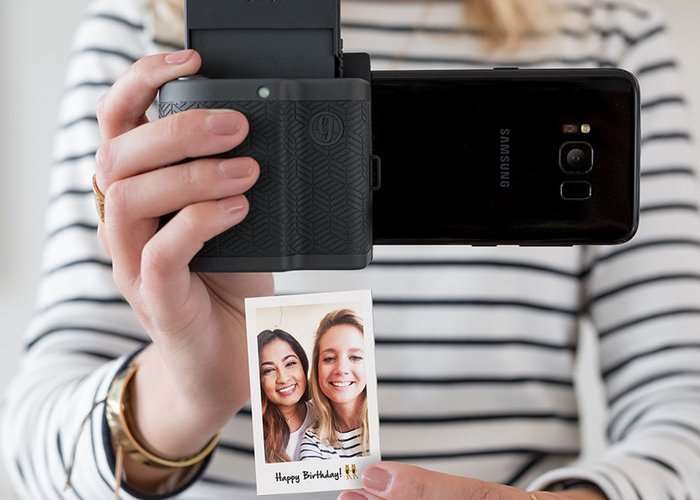 Android smartphone users who would like to instantly print physical copies of their digital photos give to friends, may be interested in a new piece of hardware called Prynt which transforms any Android smartphone into an instant camera. Simply plug Prynt in to your Android smartphone to transform it into an instant camera, capture a photograph and print a physical copy out in just a few seconds. The system also allows you to see your photographs come to life using augmented reality technology. Watch the demonstration video below to learn more. Prynt has launched via Kickstarter this week with the aim of raising $50,000 over the next 35 days and supports all Android smartphones which are fitted with a central USB-C connection. At Prynt, we love instant photography. But with the thousands of photos stored on our phones, there’s never been an easy way to print those photos, so they become lost in our camera roll or social feeds and rarely looked at again. So we‘re here to bring those memories back to our lives, in a physical way. It is our mission to make memories tangible again for a new era of moment-makers. That’s why we created Prynt Pocket, the first-ever device to transform your smartphone into an instant camera. Prynt is now available to back via Kickstarter with early bird pledges starting from just $89 and delivery expected to take place during April 2018. For full specifications and more information jump over to the official Kickstarter campaign page via the link below.